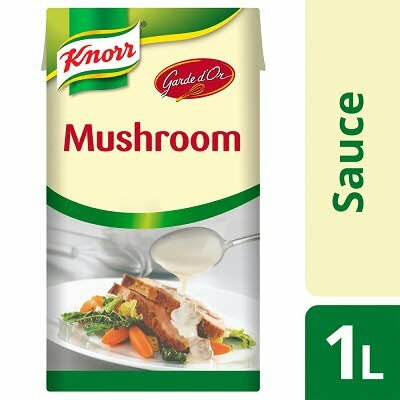 KNORR GARDE d'OR Mushroom Sauce - A delicious and versatile ready to use sauce. - Excellent on its own or enhanced by your own creative touch. - Suitable for use on the hob, in the microwave or bain marie. Water, mushrooms (12%), CREAM, sunflower oil, modified maize starch, salt, potato starch, emulsifier (E472e), sugar, flavourings, thickeners (xanthan gum, guar gum), palm oil, mushroom juice concentrate, shallots, onions, yeast extract, natural pepper flavouring. May contain gluten, egg, celery. Knorr Garde d’Or Mushroom Sauce – a delicious and versatile ready to use sauce. Excellent on its own or enhanced by your own creative touch. Knorr Garde d’Or Sauces complement meat, poultry, fish and vegetable dishes. Suitable for use on the hob, in the microwave or bain-marie. Store in a cool, dry place away from bright light and strong odours. Once opened, refrigerate any unused product and use within 48 hours.